There are eight bells in the tower of St Mary’s Church, Pilton, and they were last restored in 1969-70. Church bells were first recorded in Pilton in 1553 when there were five. These increased to six in 1712 and to the current eight in 1854. We don’t know exactly what happened to the 16th century bells, which could have shared the fate of many bells in the English Civil War (1642-46) and been melted down for cannon or shot. The original tower on St Mary’s Church (which, like that of St Peter’s Church, Barnstaple, was squat with a spire) was partially demolished in 1646. However, church records suggest that the bells could still be rung in the 50 years until the tower was rebuilt as it is today in 1696. Three of the existing bells were cast in 1712 by Abraham Rudhall of Gloucester. Then, in 1853 three of the old bells were taken to Loughborough by sea to be re-cast by John Taylor & Sons and two new ones were made. They were brought back to Barnstaple Quay via Bristol by the sailing smack ‘John & Ann’, an event reported in the North Devon Journal in April 1854. The two new bells were added at the personal expense of Robert Chichester of Hall. The total cost of the rest of the work, presumably raised by the Parish, was £158, equivalent to about £40,000 at today’s prices. The peal of eight bells was re-hung in 1901, and overhauled in 1947 and again in 1970. A large part of the cost of the last of these repairs, £2,740 (about £20,000 today), was raised by the ringers themselves. 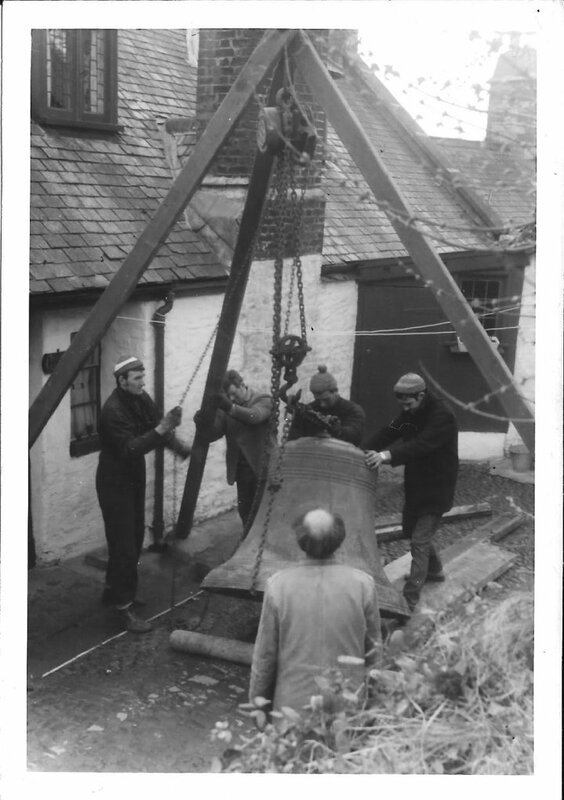 This photograph shows one of the bells after it was lowered from the tower in 1969 to be taken away by John Taylor & Co. Ltd of Loughborough for restoration. The work is being watched by the Sexton at that time, Archie Griffiths. The bells were restored to the tower on 20th March 1970. Many thanks to Harold Murch for sending us this photograph.